Buzz loves bread pudding. If he was on a desert island and could only bring along one food, I would guess this would be it. 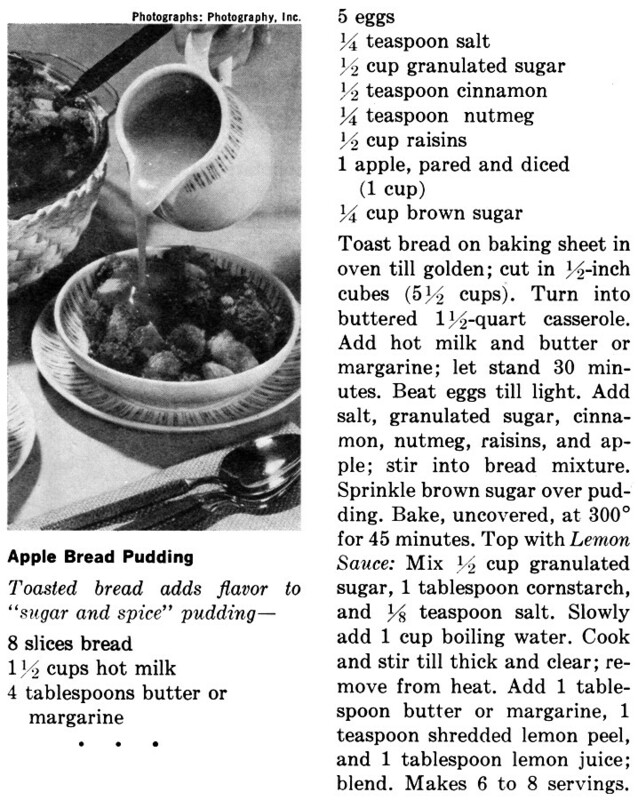 So bread pudding with fruit? YES PLEASE. 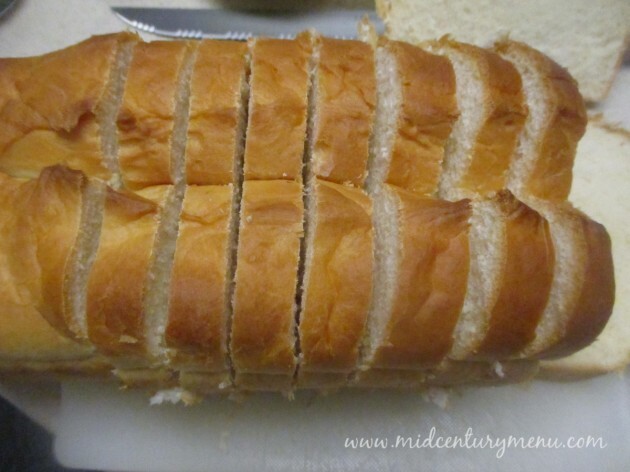 Toast bread on baking sheet in oven till golden; cut in ½-inch cubes (5½ cups). Turn into butter 1½-quart casserole. Add hot milk and butter or margarine; let stand 30 minutes. Beat eggs till light. Add salt, granulated sugar, cinnamon, nutmeg, raisins, and apple; stir into bread mixture. Sprinkle brown sugar over pudding. Bake, uncovered, at 300° for 45 minutes. Top with Lemon Sauce: Mix ½ cup granulated sugar, 1 tablespoon cornstarch, and ⅛ teaspoon salt. Slowly add 1 cup boiling water. Cook and stir till thick and clear; remove from heat. Add 1 tablespoon butter or margarine, 1 teaspoon shredded lemon peel, and 1 tablespoon lemon juice; blend. This is rather different than Buzz’s typical recipe. 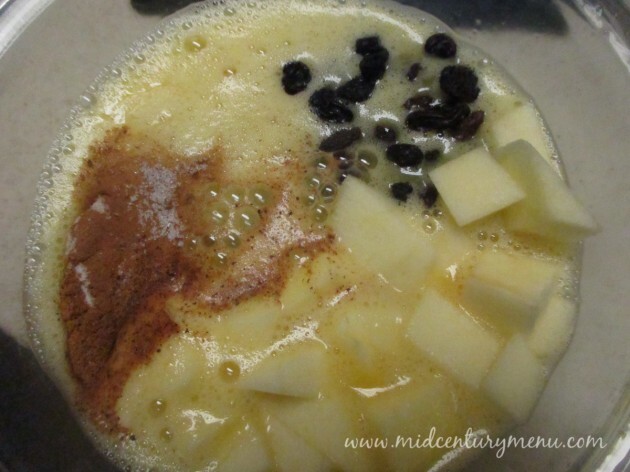 The bread chunks are soaked before the egg is added, and he doesn’t add apples or toppings. But based on his experience, we knew that a good-quality, thick-sliced bread was going to be important. Bread is pretty central to this recipe. Wasn’t everybody getting free toasters when they opened bank accounts back in the mid-century? I’m sure I remember some jokes about that. 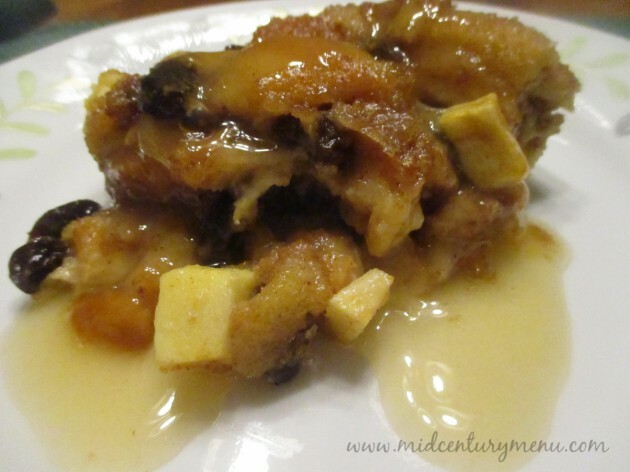 I have to admit: I don’t typically put brown sugar on top of bread pudding when I bake it. It made a really nice-looking crust on top. Buzz often smiles when he first sees a retro recipe, but it’s often a nervous or resigned smile. This one was pure happy. The brown sugar topping gives a nice crunch to contrast the gooey bread. Cinnamon and nutmeg levels are perfect. The apples weren’t critical to the dish, although it was a pleasant addition. Go light on the lemon sauce, it may start to get too sweet and cloying after a few bites, but don’t leave off the brown sugar topping! We aren’t a big “sweet” family (i have an ununquenchable and terrifying sour dough bread habit) but this sounds so yummy i might just have to give this a try! 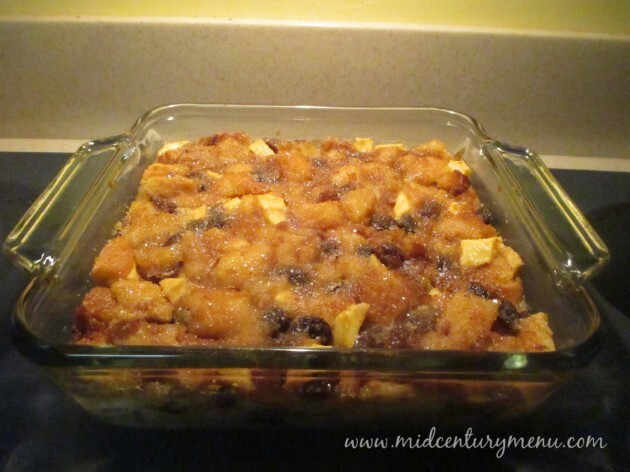 Leftover sourdough actually makes a very nice bread pudding! I bet you could make pumpernickel work with the right other ingredients. I could see maybe something with molasses tasting pretty good. It might not look very pretty though. I made bread pudding today with stale marked-down “hot cross buns” from the grocery. They were made with raisins and candied fruit pieces. It was actually very good. 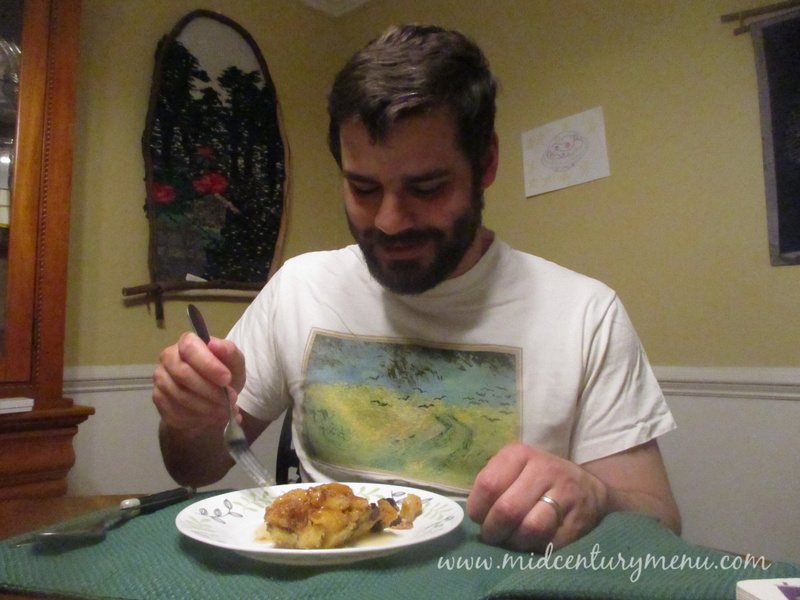 The image on the shirt is Wheatfield with Crows, by Van Gogh. I selected the shirt for this post based on its agricultural character. However, I have no idea where I originally got it. Google indicates that shirts featuring that painting are readily available online, but mine is probably about two decades old. 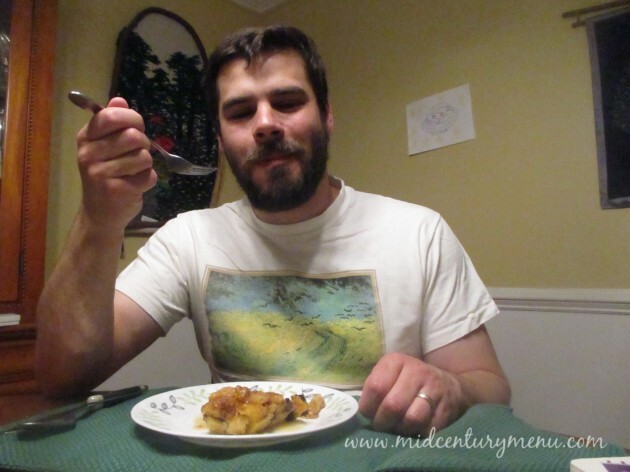 In my teens I accumulated an extensive collection of unusual shirts, a small fraction of which I am now able to show off in these tasting pictures.